We have carefully selected choice of frames available to suit all ages and pockets. You are welcome to take plenty of time to decide. Comprehensive advice given to help select the best lens type to suit your needs. Many lens manufacturers are supplied and constant improvements in design of lenses in recent years offers increased performance and thinner lenses. Until 30 June 2019 we are pleased to offer Rodenstock Colormatic lenses (photochromic) at no extra charge. Please talk to us about the benefits of variable tint lenses, to find out if the are right for you. Time for a new pair of Sunglasses? It’s that time of year to consider investing in a comfortable pair of sunglasses you will really enjoy to wear. Good quality lenses protect from harmful ultra violet light and keep your eyes comfortable. They can be made with or without optical prescription. Lenses are available single vision, bifocal or varifocal (progressive). Complete prescription sunglasses are available from £125 for single vision and £195 for varifocal. 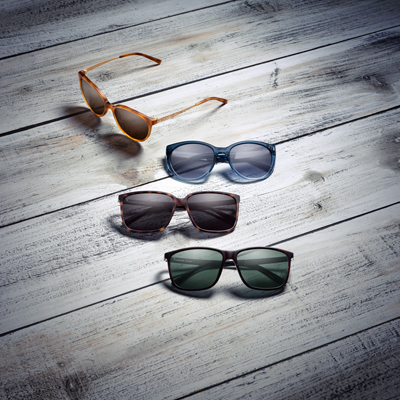 A full new range of sunglass frames are available now at D J Dunstone, including Ray-Ban and Rodenstock SunProtect. The tint can be to a colour of your choice, as well as with Polaroid if preferred. We are also able to supply prescription sunglasses specifically for many sporting activities, including cycling and golf. The team at D J Dunstone will be pleased to discuss your requirements, provide a quote and help you chose the optimum pair. Driving and vision - are you safe? Please click here for information about safe driving vision and optimum spectacle lenses. You should consider wearing eye protection suitable to the job or hobbies you do, which offer greater protection than your usual spectacles. This can take the form of a separate pair of safety spectacles and are available with single vision, bifocal or varifocal lenses. The strongest lenses are made from Polycarbonate or Trivex materials. We at D J Dunstone provide numerous types which all comply with British and European Standards. Our selection offers a good choice of styles, colours and sizes. Please contact us if you would to consider protecting your eyes and we will be happy to discuss and quote for the optimum type for your lifestyle. Pictured: a selection of safety frames available here. Derek Dunstone has been to Africa to test sight and dispense recycled spectacles with Vision Aid Overseas (VAO). Click here for more information about VAO.Thank you to everyone who has donated used spectacles over the last 25 years. It is estimated that more than twenty thousand pairs have been collected at D J Dunstone’s during this time and forwarded to VAO. The Practice will continue to collect used spectacles and so if you have any that are no longer required please do drop them off at 3 Queen Street. Thinking about having spectacles made from our prescription at another Practice? Please click here for our view. NHS Spectacle Vouchers: We are pleased to issue and accept NHS Vouchers towards spectacles for those eligible. We always aim to provide the best quality spectacles and so are unable to provide complete spectacles to the value of NHS Vouchers. An excellent selection of spectacles is available from £35 for those using voucher contribution. EyeCare Vouchers:We are sorry that we are not able to accept Endred Eyecare vouchers (provided by some employers) towards your eye examination or spectacles. This is because the voucher is worth less than £20 and we are not able to devote enough time for this level of remuneration. Their rules do not allow for the patient to pay the difference for a comprehensive examination including OCT scans.